Fees: Entrance fees are charged from Memorial Day weekend to Labor Day. From Route 55 north or south, take exit 35 and follow signs to the park.The Park is located between Centerton and Vineland on Route 540 (Almond Road). Hidden in the southwestern part of the state is Parvin State Park, a park whose history is as varied as its wildlife. Situated on the edge of the Pine Barrens, the park not only has pine forests typical to the area but also a swamp hardwood forest. Spring bursts out in bright colors and rich fragrances with blossoming dogwood, laurel, holly, magnolia, wild azalea and over 200 kinds of flowering plants. 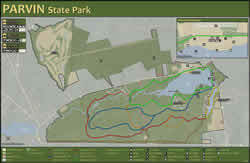 Thundergust Lake, Parvin Lake and Muddy Run are popular for fishing and boating. Swimming is allowed in Parvin Lake only. This park served as home for the Civilian Conservation Corps from 1933 to 1941, a summer camp for the children of displaced Japanese Americans in 1943, a POW camp for German prisoners in 1944 and temporary housing for the Kalmycks who fled their homelands in Eastern Europe in 1952. Park Office: Monday through Friday 8 a.m. to 4 p.m.
Campsites: 56 tent and trailer sites with fire rings, picnic tables, lantern hooks and a playground available. Six people and two vehicles per site. Flush toilets, showers, and laundry facilities are within walking distance. Facilities available for people with disabilities. Trailer sanitary station. Located on the south shore of Parvin Lake. Open April 1 to October 31. Fee: NJ Residents: $20 per night; Non Residents: $25 per night. Group campsites: Four group sites with flush toilets, water, fire rings, picnic tables, one shelter. Located on south shore of Parvin Lake. Each campsite accomodates up to 25 people. Open April 1 to October 31. NJ Resident $50 per night; Non Resident $100 per night. Cabins: 18 cabins each with furnished living room with a fireplace or woodburning stove; outdoor campfire rings; two bedrooms to accommodate 4 people; kitchen with running water, electric stove, refrigerator; bathroom with sink, toilet and shower; electricity; brick patio with table and grill. Two of the cabins are accessible for persons with disabilities and offer accommodations for 6 people. Playground available. Cabins are located on the north shore of Thundergust Lake. Cabins are available for rental for a 7 night minimum from Memorial Day to Labor Day. Open April 1 through October 31. Fee: Four-bunk cabins: NJ Resident: $55 per night; $385 per week; Non Resident: $65 per night; $455 per week. Fee: Six-bunk cabins: NJ Resident: $75 per night; $525 per week; Non Resident: $85 per night; $595 per week. Situated at the edge of the New Jersey Pine Barrens, the Parvin Natural Area combines many of the characteristics and species of southern New Jersey and the Pine Barrens. Several trails run through the hardwood and Atlantic white cedar swamps, pitch pine lowlands and upland pine and oak forests. Parvin is home to the state-threatened barred owl and the endangered swamp pink. A lifeguard staffed swimming beach is provided at Parvin Grove, which is located on Parvin Lake. Parking areas, bathhouse, first-aid station, canoe rental and a concession offering refreshment, novelties and beach supplies are all conveniently located nearby. Picnic Groves with tables and grills and playgrounds are located on either side of the beach. Swimming in the designated swimming area while lifeguards are on duty. Please check our swimming schedule prior to your visit. Inner tubes, rafts and other flotation devices are not permitted in the swimming area. Only Coast Guard approved life jackets are permitted. Pets are prohibited on the beach. A public boat launch ramp is located at Fisherman's Landing. The launch ramp is available from sunrise to sunset year round. Parvin Lake is electric motor only. From Memorial Day Weekend to Labor Day, required permits can be purchased at the park office. Several picnic areas with table and grills are located throughout the Park. For larger groups, we also offer two reservable picnic areas at Thundergust Lake, 100 people per pavilion; total capacity 200. Flush toilets, water, grills, picnic tables, activity and ball fields available. 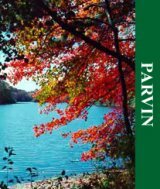 The Parvin State Park Appreciation Committee was organized to promote the use of the park by the public and to educate visitors on its rich history and by providing volunteer support of labor and equipment to help maintain the park in a safe manner.